Look where your going when running Weiss Lake during drawdown. Its a hazardous lake when low. Weiss Lake is normally down 3-5 feet until mid April. This lake has a lot of 5-10 feet of water when at full pool, so you can imagine what’s just below the waters surface, when its down 4-5 feet. When navigating this huge, sprawled out, shallow impoundment, stay near the river channel buoys and watch for floating logs during March and early April. Spring rains can swell the lake and create floating obstacles. This can also create some very muddy water situations during Spring. Incoming creeks, lake headwaters and two major feeder rivers at mid-lake (the Chatuga River and the Little River) can become very unproductive when muddy. If very muddy water conditions are encountered, look for clearer water conditions in mid-to-lower lake regions. There are some Big Bass in Weiss Lake. From the lakes headwaters in Georgia to the lower Weiss Lake Dam, bass over 10 pounds are caught each spring. Good quality reels (ABU Garcia 5500, 6500 reels and Revo models), loaded with heavy line like, Trilene Big Game monofilament line (in the 15-20 pound test category) or fluorocarbon line. Stout tackle, equipped with sharp, quality (Gamakatsu) hooks are suggested. These suggestions are actually a must, especially when it comes to landing these largemouth bass, spotted bass and on occasions, a huge tackle testing striped bass on Weiss Lake. Berkley’s Trilene Big Game line in the 15-25 pound test or one of their fluorocarbon lines is suggested for fishing all lures. I have used Berkley line since its introduction to the public for bass fishing. On guided trips and in bass tournaments (when money is on the line)…and it never fails for me! Not many lakeside residents in Alabama can boast of big largemouth bass being caught in their lake, during Spring. This especially holds true when referring to largemouth bass exceeding that seemingly “magical” ten pound mark. But, Weiss lake residents can! Weigh-ins during past spring time bass tournaments on Weiss Lake have shown anglers bringing in bulging bags of bass! Even nowadays, 5 bass weighing 20 pounds, may not even get you in the top 5 in most major spring time bass tournaments held weekly on Weiss Lake! 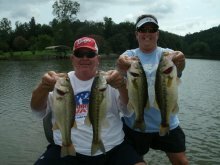 Most bass tournaments held during the spring season on Weiss lake (the first lake on the Coosa River System), are usually topped off with several bass brought in weighing in the 7-10 pound range. “Why this lake”, you may ask? Just like most fertile, shallow water impoundment’s featured throughout the south, Weiss lake grows BIG bass. 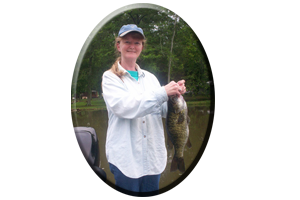 Its growing season is year-round and BIG bass are found lake wide, year round on Weiss Lake. Its just that the majority of the big bass population do have to visit the shallows at least once a year and that’s to spawn. That is also when these huge bass are very susceptible to hundreds of anglers fake offerings. The odds are just stacked in the anglers favor during these three months of spring of connecting with a real wall hanger. When fishing in March be prepared, for unforeseen conditions can throw even the best bass angler a real curve ball. Cold fronts, heavy rains followed by muddy water or sunny high pressure conditions, all severely affect these shallow water Weiss Lake bass. During these times astute anglers may have to adjust and stay on the move fishing lots of shallow water looking for the best conditions. Or if conditions such as severe cold fronts arise, you may be forced to slow your presentation tremendously. This can call for the use of lures that have rattles, lures that create a lot of flash or vibration and utilizing lures that make some type of noise or water disturbance. It may also mean going deeper, fishing deep water drops near the spawning grounds where bass retreat to during these negative periods. These bass can home in on these lures, effortlessly detecting water displacement, flash or vibration created by many types of lures. This is when attributes such as their unforeseen inner ear called a “lateral line”, determines whether or not they eat. So what would the best all around lure for both shallow and deep water applications, despite the conditions during spring? Spinnerbaits – Spinnerbaits are available today in all shapes and sizes. They come in a variety of configurations, various colors and blades styles and they are a must for springtime anglers to stock up on for any lake! They come in sizes of one eighth ounce for very shallow water applications or when down sizing is necessary. Or you may need the (unheard of) weight of one and half ounce – to two ounce size spinnerbaits. These are used for dredging the lakes bottom in deep water and are good for all freshwater game fish! Just remember as always, to fish safe. Tell your partner to stay back when you are casting these heavy big chunks of metal…you would not want to hit him with one of these! In more suitable conditions, such as during clear water periods, during rising water temperatures, rising lake levels, during heavy rains or when cloudy low light conditions are evident, these bass will feed by their eye sight. 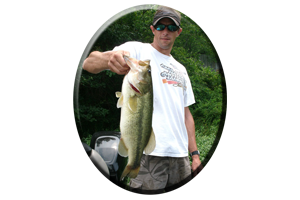 Big, fool hearty, prespawn bass, can be fooled with lures such as soft and hard jerkbaits, spinnerbaits, crankbaits, floating worms, topwaters and a variety of bottom bumping lures, especially when they are active and induced to feed by these conditions. Generally in cold, stained water conditions, you must fish slow or near bottom. In clear to lightly stained water above 60 degrees, you can fish shallow to mid-depths, even topwaters, with a much faster approach and with faster moving lures during March on Weiss lake. Keep in mind all throughout the month of March many BIG bass are still in deep water, often holding along old river and creek channel ledges. With cold fronts pounding the south throughout the month of March, its very likely. Deep-diving crankbaits and Texas and Carolina-rigged lures, Tube baits, small finesse lures, jigging spoons and jig combos can aid an angler in targeting these deepwater bass. During spring, these are bass a lot of shallow water anglers overlook, usually sitting right under the boat of the bank beating angler. On Weiss Lake keep in mind there are many resident-planted brush piles found along flats and around piers in prime spawning grounds. Brush piles, now hold more than one prespawn bass. Many of these brush piles (and other man made cover) are away from the banks, but they are exposed for all anglers to see, for future reference when water levels come back up in April. When water temperatures reach the mid to upper 60’s and lake levels are on the rise, the bass move up to spawn on Weiss lake. This will take place from mid-to-late April when the lake will be back to full pool. New growing aquatic weeds will begin to appear in April as waters warm. Both male and female bass move into water as shallow as six inches deep, holding in shallow weeds near prime spawning grounds. As on all Alabama lakes, these are spooky bass, bass not accustomed to being in very shallow water for long periods of time. A quite approach will be needed to assure quality strikes. Spotting cruising bass or bedding bass can be easy with clear, shallow water. 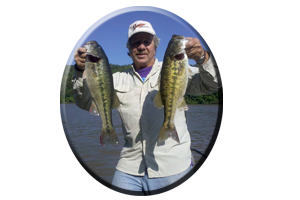 But on Weiss lake during Spring this is often not possible and looking for signs of bedding bass, will help in directing your cast’s to likely areas for some big spotted bass and largemouth bass. Weed movement, boils, wakes or ripples of bass moving around, will help you detect these bass as they are alerted to your presence as well. Utilize long casts in this situation to avoid spooking bass near the boat. 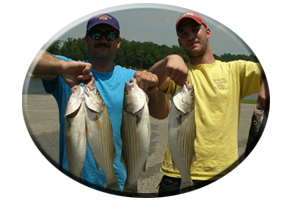 Always wear polarized sunglasses for spotting underwater cover, beds and even cruising bass. Remember to release these bass to spawn, and to live and fight another day. This lake comes alive during May. Under normal conditions Weiss lake is back to full pool by the first week of May. New weeds will be visible and flooded shallows will give bass hundreds of miles of water to roam in. Some bass will still be bedding in cooler lake regions. But the majority of Weiss Lake’s bass population will be recuperating from the rigors of spawning and feeding to regain strength. Also while feeding to fill an empty belly fast, foolish bass go on a feeding rampage and make foolish mistakes. Topwater is the pattern for May on Weiss lake. With Spring rains at a minimum, the stage is set for some awesome surface blow-ups, as bass feed once again in reckless fashion. Now matter what the lure, for a period of a few weeks, these bass will strike as if trying to kill the intruder. Buzzbaits will be nailed now by both male and female bass in water 1-3 feet deep. Floating worms, lizards and soft jerkbaits, will take some big bass in surprisingly very shallow water. In and around rocks, wood and weedy cover try Zara Super Spooks, prop-baits, crankbaits, jigs, spinnerbaits, minnow type lures and suspending jerkbaits. Great lures for post-spawn bass. Fishing around man made dams, causeways and bridges rip-rap (rocks) are also good places to fish these type of lures this month. * Always keep this thought in mind during May. “Bass away from the shallows”. When you do, you can count on having places where big bass bunch up…usually all to yourself. Remember, “Bass away from the shallows”. 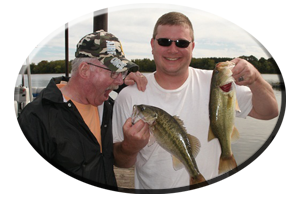 * During May many bass suspend or hold away from the shallow spawning grounds. They can be found (with some research) around shallow ledges, ditches, old creek channels, in obscure shallow drop-offs, stump rows and along irregular bottom features. The same places along travel routes that brought them shallow a few weeks back. * These are places of recuperation and most bass are near spawning grounds still feeding right on into early summer. But these spots out away from the spawning grounds in water as little as 3-5 feet deep, are often overlooked by the now conditioned, shallow water angler. Most of which are still glued to the banks. * Or you can call always call on Reeds Guide Service (205) 663-1504 for fishing Bankhead lake or any Alabama lake, year round!